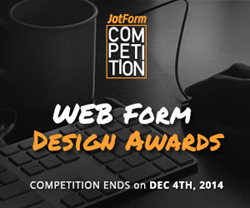 To introduce the new Form Designer to the design community JotForm is running a contest. Users can build and enter their best designs for a chance to win the $7500 Grand Prize for the Best Form Design. To introduce the new Form Designer to the design community we’re running a contest. Users can build and enter their best designs for a chance to win prizes. The Grand Prize for Best Form Design is $7500. JotForm, a popular online form builder with over 1.5 million users, is launching the Web Form Design Awards, a contest recognizing the best form designs. All submissions must use the company’s recently launched Form Designer feature, which takes the time and hassle out of creating a beautifully designed form. Entries will be accepted from Tuesday, Nov. 4 through Thursday, Dec. 4., with the top prize receiving $7,500. JotForm Founder, Aytekin Tank, said he was so impressed by what users were creating that he felt a contest was the best way to showcase the full capabilities of the new feature. The contest will be judged by well-known web designers, graphic designers, blog editors and book authors, who will award the grand prize for “The Best Form Design” of $7,500, and a $500 prize to each of the other category winners. All form design entries must be built utilizing JotForm's Form Designer, and all form admissions must be fully functional to be considered. The Form Designer has extensive web design customization options, graphic design tools and an advanced CSS editor. The first 100 complete submissions will win a free T-shirt, and the winners will have their names promoted on the JotForm blog and Form Theme Store. “Since the beginning of Internet, web forms have hardly changed. JotForm aims to fix that; end the stagnation; and invent a new future for forms. The Web Form Design Awards is another step toward this ambitious goal,” Tank said. For more information on the contest rules, please visit http://www.jotform.com/awards. Founded in 2006, JotForm is an online form builder with over 1.5 million users. JotForm hosts 6 million forms and has processed over 100 million form submissions. JotForm is free for most users and offers 7,000 user-friendly form templates. Consumers have the option to pick and choose a ready-made template to help jumpstart their own use with the most common being contact forms, surveys, online order forms, registration forms, application forms, online booking, event registration and file upload forms. For more information, please visit http://www.jotform.com.